Step 1: Two coats of For Audrey on all fingers except feature finger, which got two coats of Paper Mache. Step 2: Wait for this polish to dry for at least two hours or it'll probably peel off (as I learned the hard way...grrr). Step 3: Criss-Cross striping tape from top edge to bottom. Step 4: One nail at a time (except feature), fill the bottom triangle with Man Hunt. The Pinspiration instructions said to use a dotting tool but that didn't work for me because the polish didn't go on very evenly. So, I used a smaller brush and that worked better. Not perfectly, but better. Step 5: Remove the tape right away or the polish will peel (as I learned the hard way, again...double grrr). 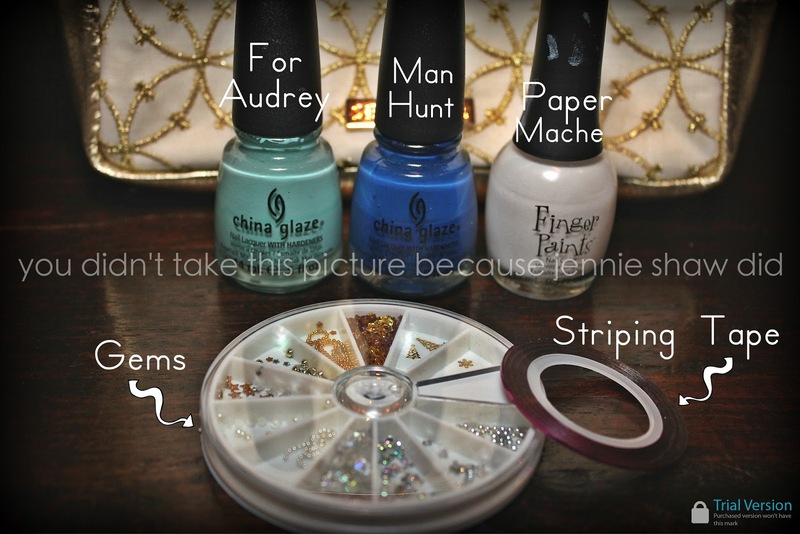 Step 6: Fill sides of feature finger with For Audrey and bottom with Man Hunt. Step 7: Remove tape right away. Step 8: Let dry and then add a cute little gem on the feature finger where the points meet. Step 9: Gob on the top coat so the gem stays on. So, this mani was pretty labour intensive. Mostly because the freaking polish liked to ruin my life peel off. I love it, though and now that I've learned the tricks, would totally do it again. Oh wow! You again have outdone youself. I would never have the patience to finish this type of look off! However, you my girl, are awesome! 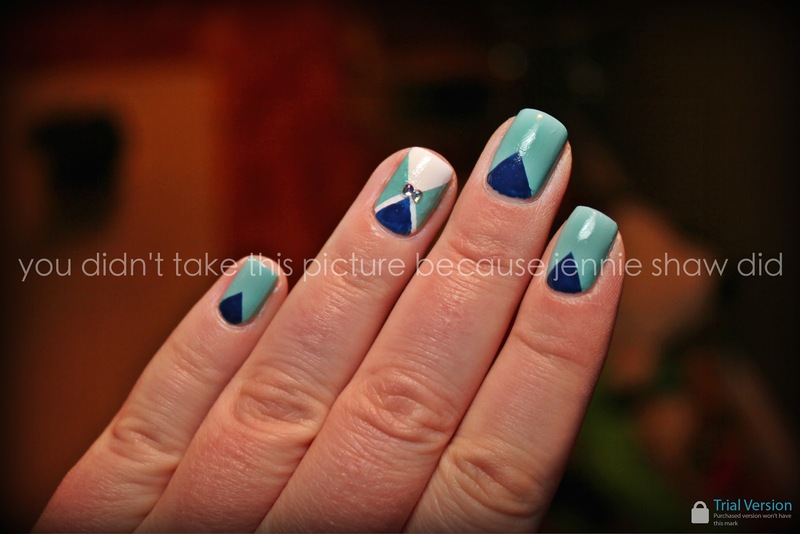 This looks AWESOME Jennie! I love your addition of the rhinestones! You always have the best nails! The little jewels are such a great touch. You seriously do the coolest things with your nails! I can barely paint them without getting polish all over the place :). love that we both used tape in our mani's this week! savior! Wow! Love it. Great job girl!!!! I love your pinterest inspired manis. This one is great and I have some striping tape on its way to me. I'll keep something like this in mind for when it arrives. you are consistently more awesome than your pinspiration! love it!